The Washington wine industry is all about small, family wineries, and one winery that puts a particular emphasis on this point is Sonoris Wines. 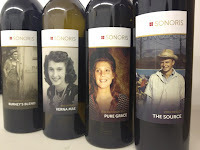 Sonoris winemaker Hillary Sjolund started out as a premedical student at U.C. Davis. One of the prerequisites was to take a class in the agricultural division. Sjolund’s choice? Introduction to Winemaking. It would be a fateful decision. “From the first or second class I was like, ‘Wait. You can get a degree in this?’” Sjolund says. “’Drink wine, eat food, travel and still do science? Sign me up for this!’” From that moment, Sjolund dove in head first, ultimately graduating with a degree in fermentation sciences, which included brewing and distillation (“I loved distillation!” she says enthusiastically). Upon graduation, without a full time position available at Pine Ridge, Sjolund headed down to Chile to work in the wine industry there. One of the people she met was famed consultant Pascal Mardy. When Mardy was subsequently hired to consult at Pine Ridge and had an assistant winemaker position to fill, he asked Sjolund to join. The winery’s logo contains four squares that represent the family logo. “Each square represents a person – mom, dad, grandma, and grandpa,” Sjolund says. The label images each have vintage pictures of her family. There are two whites, both fermented in stainless steel. The ‘Verna Mae’ Viognier is named after Sjolund’s grandmother, who passed away in 1994 (Erratum: Verna Mae is alive and well! ), with the label showing her high school picture. The ‘Pure Grace’ Sauvignon Blanc label shows a picture of Sjolund’s mother in 1972 when she was getting ready to go out on a date, standing in front of the skin of a moose she shot up in Alaska. For the reds, ‘Burney’s Blend’ is named for Sjolund’s grandfather and has a picture of him row cropping peas in 1935. He is now 97 years old, and Sjolund says she receives a phone call from him weekly asking how she is doing and how much wine she has sold. To help pay the bills while she gets the winery started – and also reflecting her love of science - Sjolund started EnoMama in June of 2011. The company does everything from vineyard sampling through quality control. It currently services approximately 20 different winery clients. Sjolund runs the operation out of Richland where her production facility is located. Sonoris Wines produces approximately 1,000 cases annually. Picture courtesy of Cheese Louise. (Excellent) An aromatically appealing wine full of citrus peel, lime, and light lees notes. The palate is medium-plus bodied, very clean, pure, drawn out with tart, white grapefruit flavors and a lingering finish. 100% Sauvignon Blanc. Gamache Vineyard. Fermented and aged in stainless steel. 14.1% alcohol. Approximately 130 cases produced. Sample provided by winery. (Good/Excellent) An aromatic wine with peach, honeysuckle, melon, and floral notes. The palate is medium-plus bodied with a rich, clean feel. 78% Viognier, 22% Roussanne. 13.3% alcohol. Sample provided by winery. (Good) An aromatically intriguing wine with carob, red and black fruit, toast, and very light, high toned herbal tones. The palate has surprisingly restrained fruit and chocolate flavors along with grainy tannins leading to a vanilla-filled finish. 75% Merlot (Red Heaven, Scooteney Flats) and 25 Cabernet Franc (Champoux). Aged in French oak (60% new). 15.0% alcohol. 94 cases produced. Sample provided by winery. (Good/Excellent) An aromatically appealing wine with high toned dried herbs, pencil lead, and cherry. The palate has a mixture of boldness and restraint with the tannins just a touch dry. 94% Cabernet Sauvignon (Blue Mountain), 3% Merlot (Weinbau), and 1% Petit Verdot (Dionysus). Aged in French oak (30% new). 14.8% alcohol. 198 cases produced. Sample provided by winery. (Excellent) An aromatically restrained wine with freshly tilled soil, floral notes, cherry cola, vanilla, and pencil lead. The palate is full flavored with restrained fruit and firm but well integrated tannins and a vanilla filled finish. 63% Petit Verdot (Blue Mountain) and 37% Merlot (Weinbau). Sample provided by winery. (Excellent) An aromatic wine with exotic spices and blueberry. The palate is deliciously rich and sweet with chalky tannins. 33% Touriga Nacional, 34% Souza, 33% Tinta Cao. 18% alcohol. 6% Residual Sugar. I just saw Verna Mae this weekend and she looks healthy as ever! Seriously, Hillary's grandmother Verna is still alive. Anonymous, thanks for letting me know this. I have added an erratum to the article. Is this winery and labels the "bizarro world" Spring Valley?